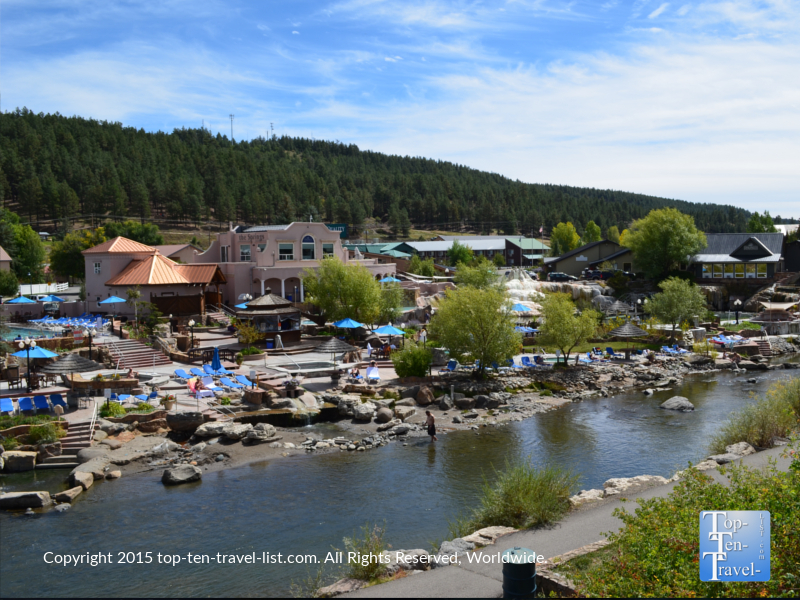 Vacation Spotlight: Pagosa Springs - Top Ten Travel Blog | Our experiences traveling throughout the US. 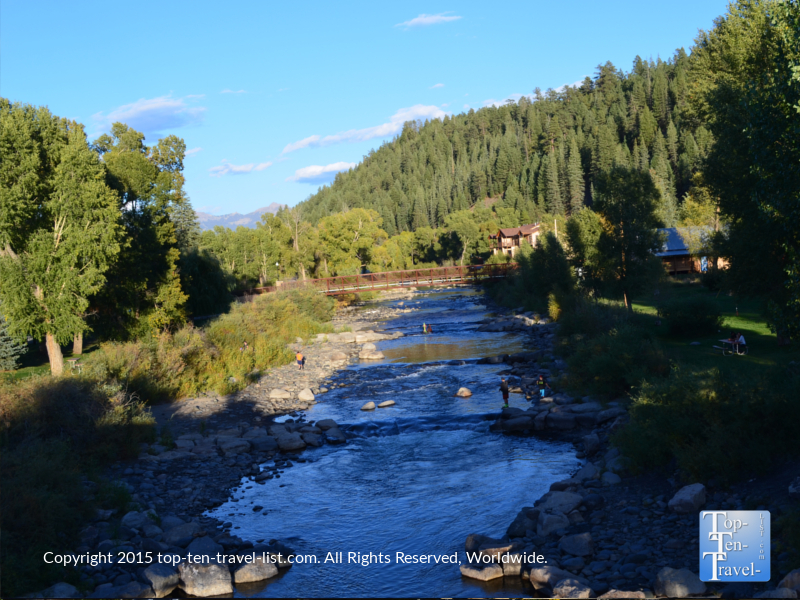 Pagosa Springs is a gorgeous small town in the Four Corners region of Southwestern Colorado. 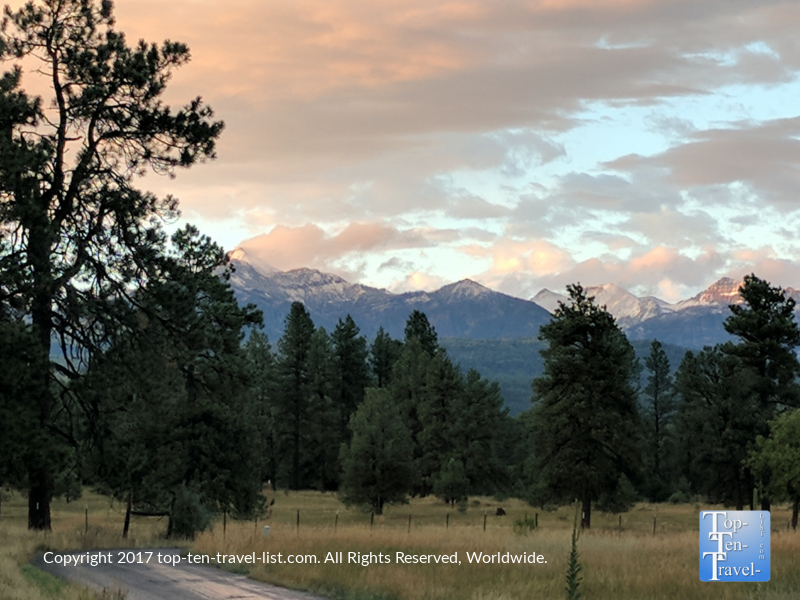 Because it is surrounded by the beautiful San Juan Mountains and home to a number of natural wonders, Pagosa is the perfect choice for anyone seeking a relaxing, rejuvenating vacation destination. 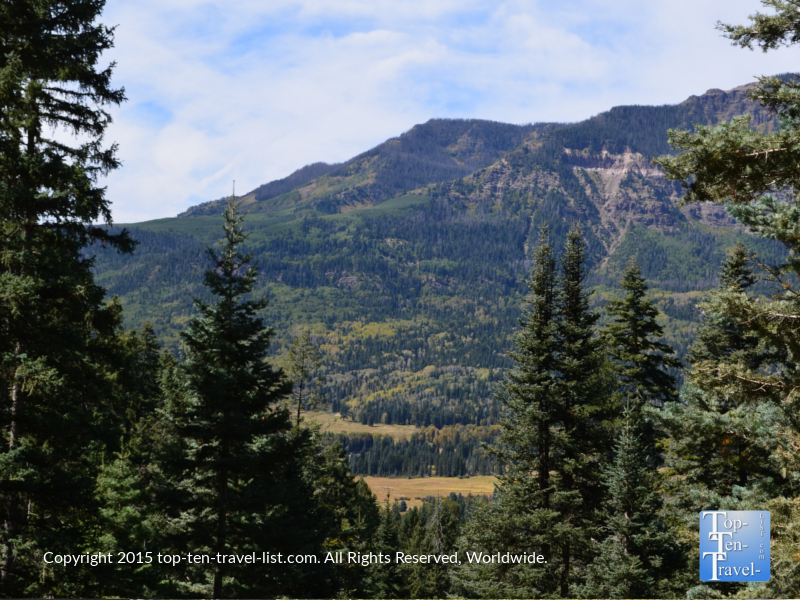 The gorgeous natural scenery of Southwestern Colorado combined with amazing natural hot springs and endless opportunities for outdoor recreation in the most gorgeous natural setting, make Pagosa Springs a perfect vacation choice for outdoor and nature lovers. 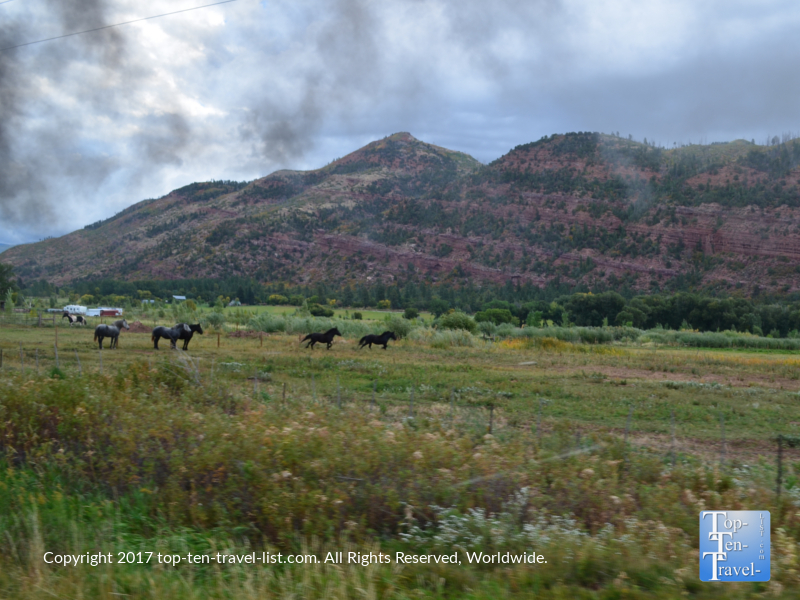 The small town ambiance and easy access to nature allow for ultimate relaxation, unlike other more touristy Colorado vacation destinations which are too crowded to be all that relaxing. 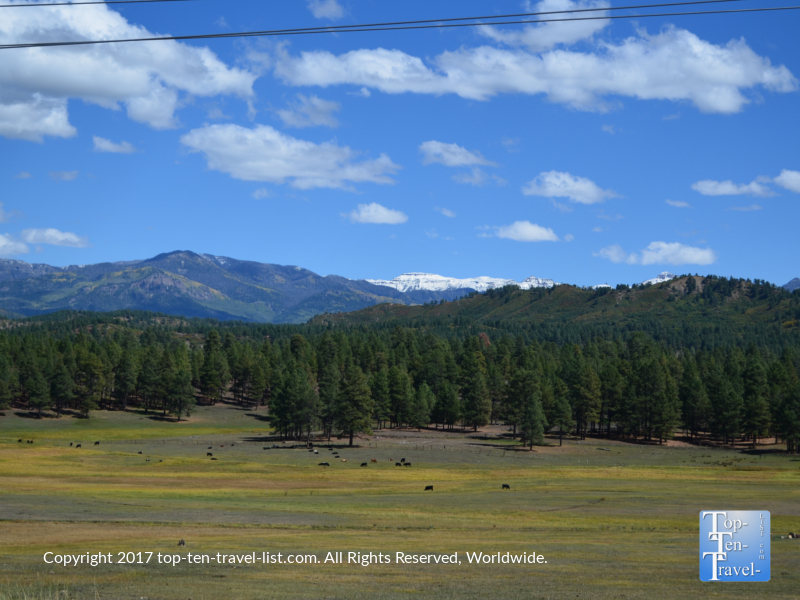 Pagosa Springs is surrounded by the beautiful San Juan mountains and the San Juan river flows right through the middle of town. The massive San Juan National Forest is spread out over almost 2 million acres. The mix of aspens and pines ensures gorgeous scenery whenever you visit. 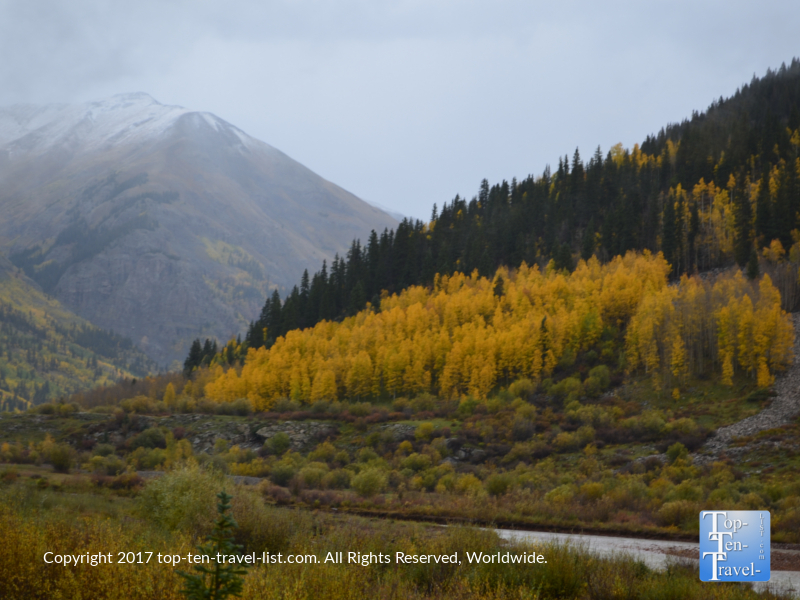 Fall is really spectacular as the leaf peeping is amazing with the brilliant golden aspens dramatically popping out amongst the green pines. Lots of wildlife call the San Juan Forest home and although the last grizzly was spotted in 1979 they are thought to possibly still inhabit the region. There are dozens of hikes within this gorgeous forest as well as numerous other recreational opportunities. 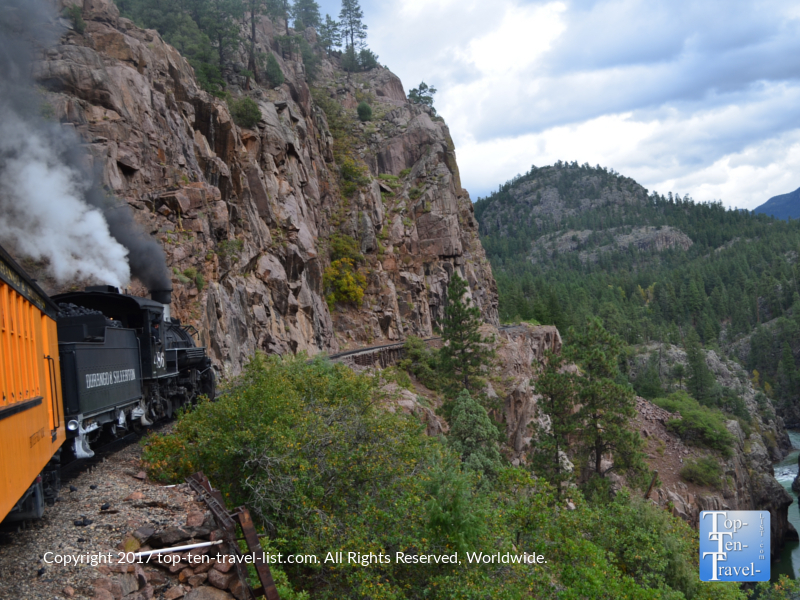 Additionally, the nearby Durango and Silverton Railroad passes through portions of the forest that are not accessible any other way. 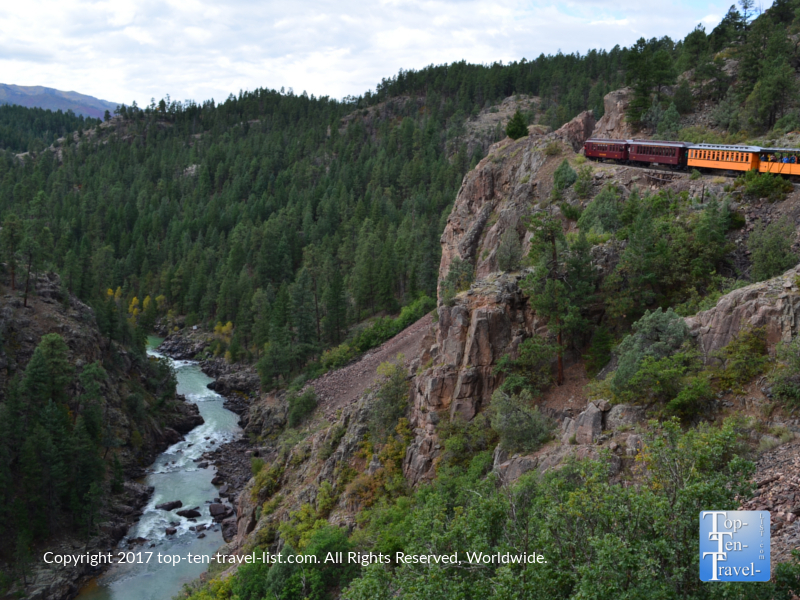 This spectacular train ride (which is covered in detail later on) is one for your travel bucket list – the views are top knotch! 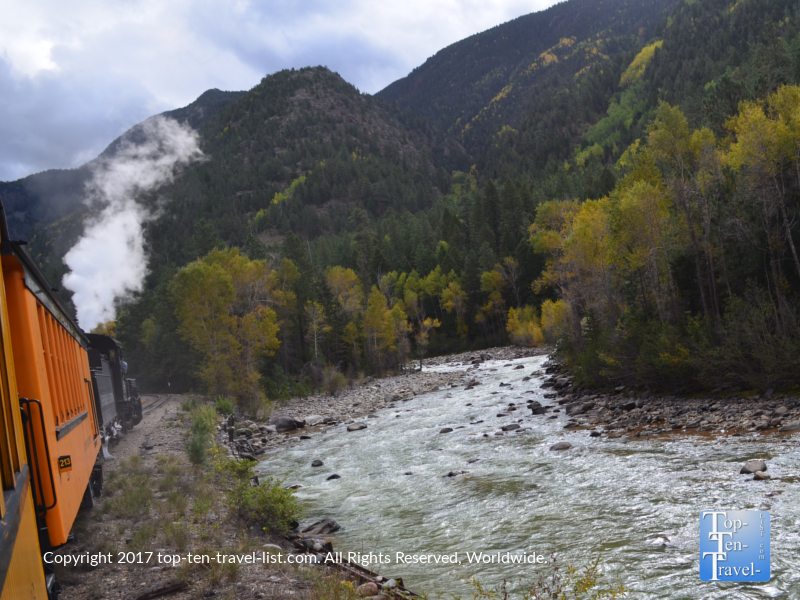 A ride along the Durango Silverton Narrow Gauge Railroad, just an hour away, is definitely a must-do on your trip! 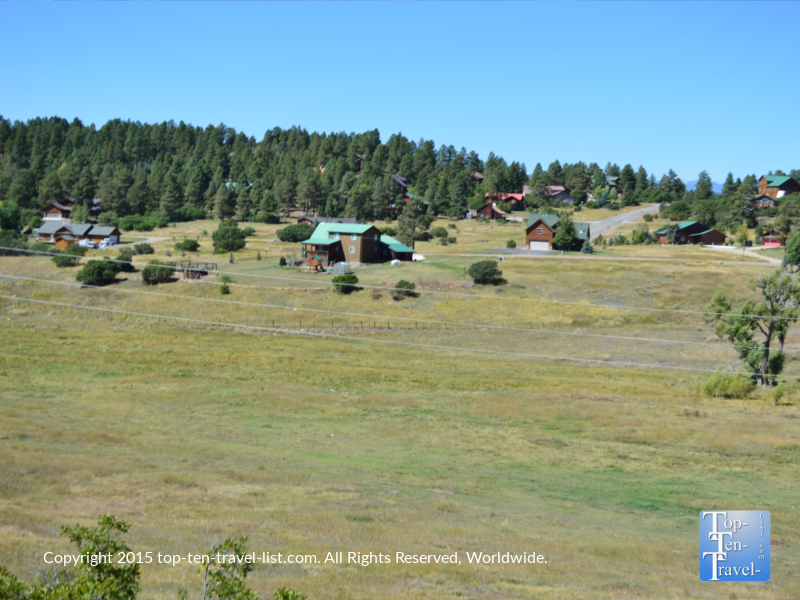 Pagosa sits at an elevation of 7000 feet, which means beautiful cool summer days and frequent winter snow storms. 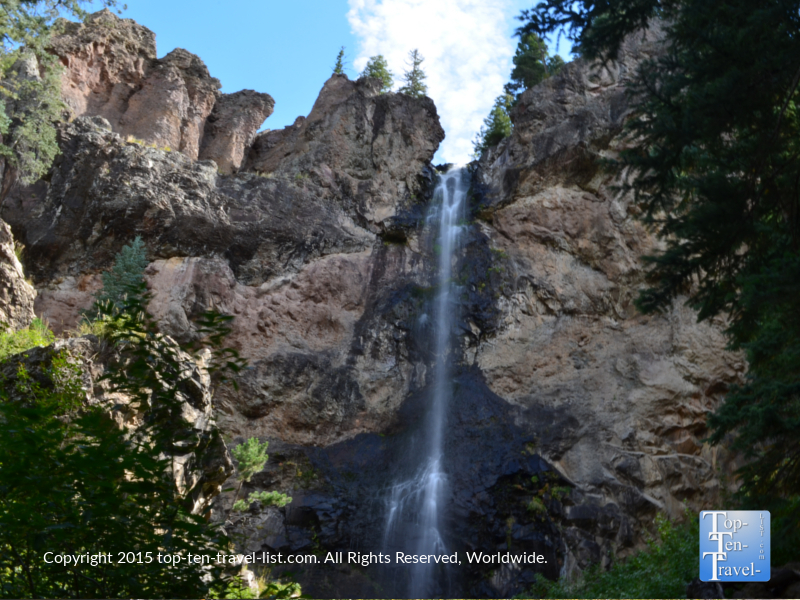 While summer is one of the best times to visit as the hiking trails here are really incredible and the weather is just the right, visiting any time of the year really works in a town like Pagosa. 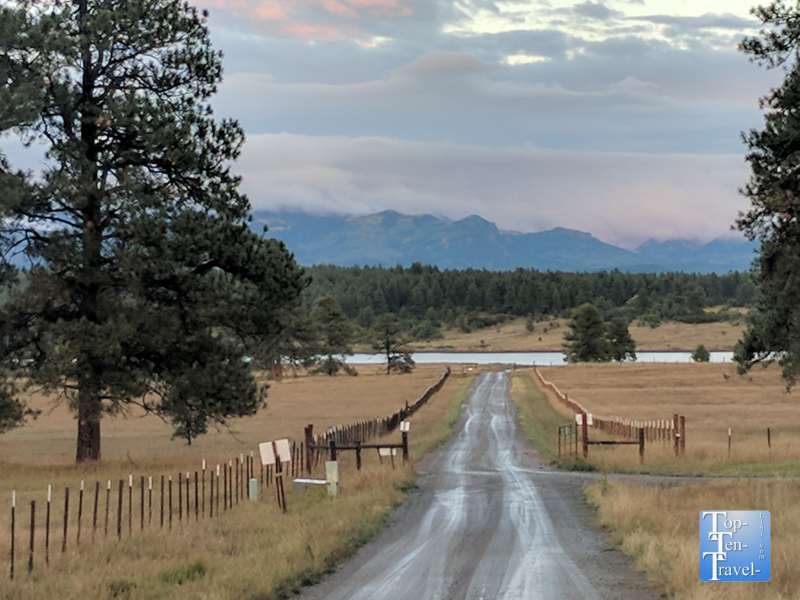 The colors are gorgeous for leaf peeping in the fall and there are plenty of fun winter activities, so really there is outdoor fun to be had all year-round in Pagosa. First off, you will need a place to stay. 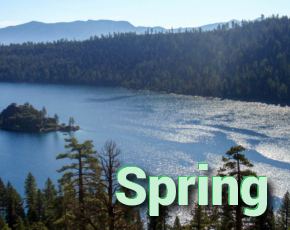 There are a few dozen options in town including the very popular Springs resort, which is usually booked out months and advance and can be really pricey. Fortunately, there is a really nice rustic lodging choice which is much better than The Springs. 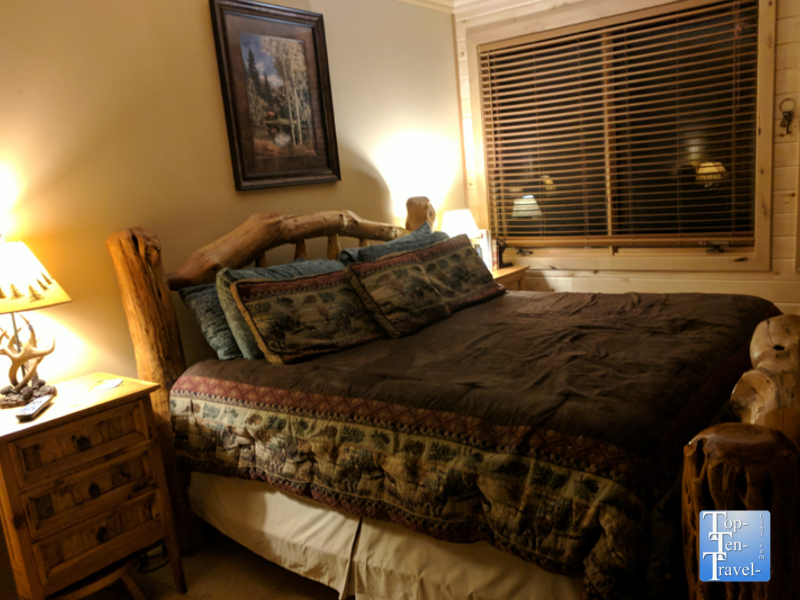 I really recommend checking out the Elk Trace Lodge Bed and Breakfast. This is by far the most relaxing B &B I’ve ever stayed at. The massive 8000 acre property is located out in the country and is surrounded in every direction by pure wilderness. You can even see Pagosa Peak (a prominent 12,000+ foot mountain) from here. 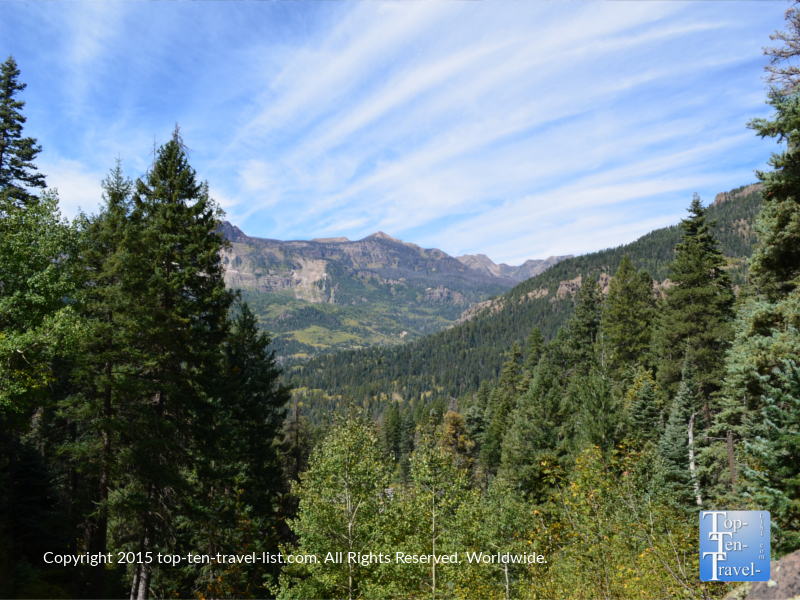 The gorgeous San Juan National Forest backs the property and the views are just terrific. 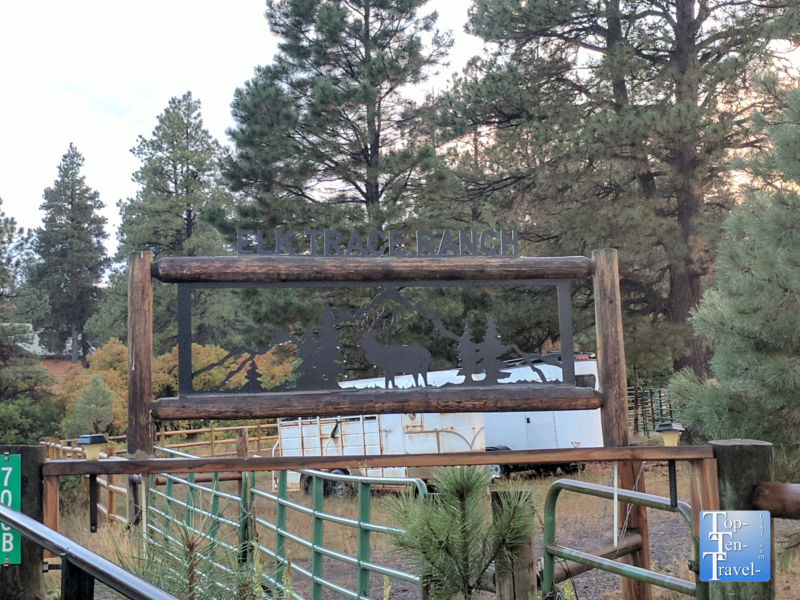 As Elk Trace is a working ranch, there are horses and cows on-site so the overall environment is just really relaxing and natural. Additionally, there is a gorgeous lake about 1/2 mile down the road. Take a walk over and enjoy a breathtaking sunset over the mountains. The inn owners are incredibly friendly and even went out of their way to make breakfast for us super early before our train ride. 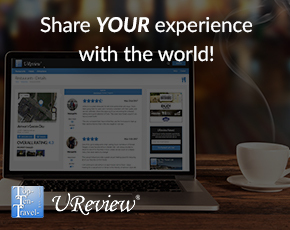 They go out of their way to entertain guests and can help you with area activity recommendations. Nightly wine and 24 hr coffee are provided for guests. The cabin is gorgeously decorated in a rustic theme which fits in perfectly with the overall outdoorsy surroundings of the region. Being out here in this secluded natural setting really is the perfect opportunity to rejuvenate and enjoy the great outdoors. Each room is tastefully decorated in a cute mountain theme as well. There are just a handful of rooms, so the inn never feels overcrowded – allowing you to enjoy a truly relaxing getaway in the mountains. 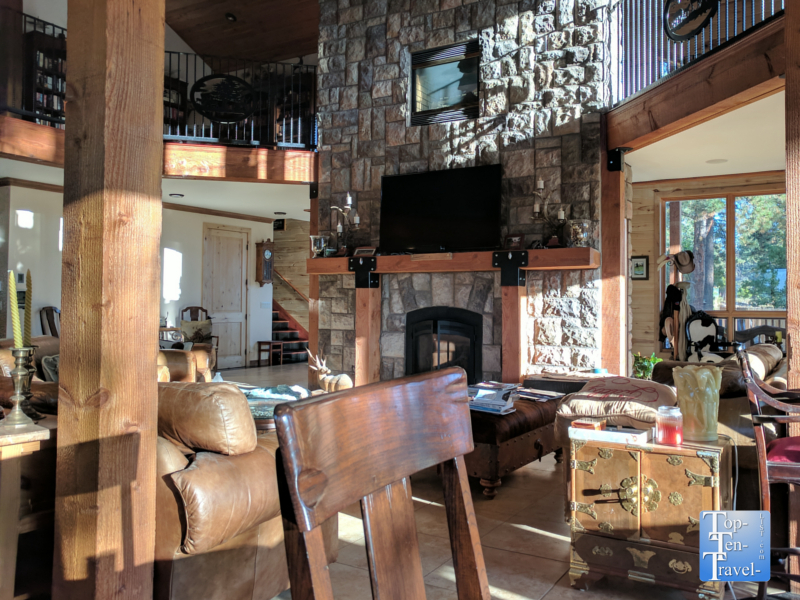 The cozy living room, complete with a fireplace and several cozy couches, is the perfect place for a morning cup of coffee prior to breakfast or a relaxing glass of wine after your evening activities. The rooms here are gorgeous decoratively in a cute little mountain theme. There are so many extra little design touches. It’s very cozy and comfortable. 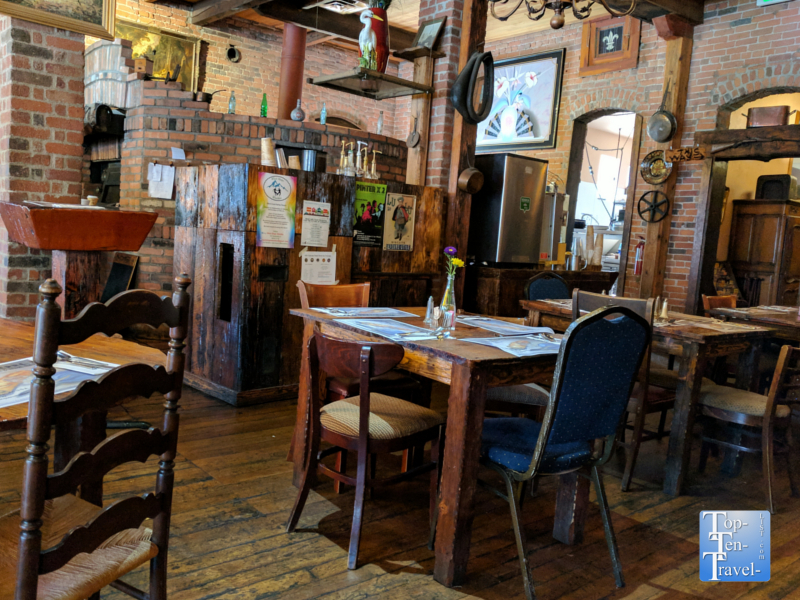 A full hot breakfast is provided each morning in the cozy rustic living area. In the winter, you have a roaring fire in the background, and during the summer months you have the option of enjoying your meal on the beautiful wrap around deck, which is surrounded by gorgeous pines. You may even see an occasional black bear due to the super secluded setting. 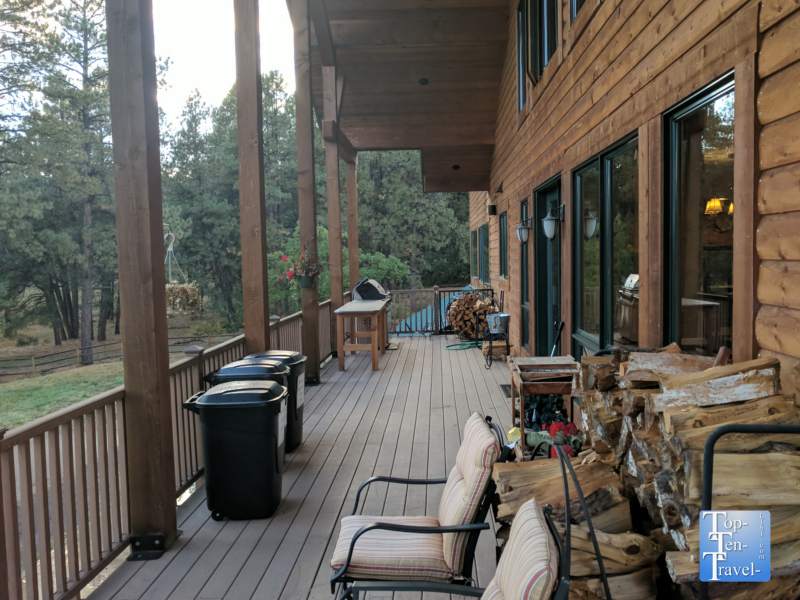 The wrap around deck is so gorgeous – I could sit here all day and take in the gorgeous mountain views! 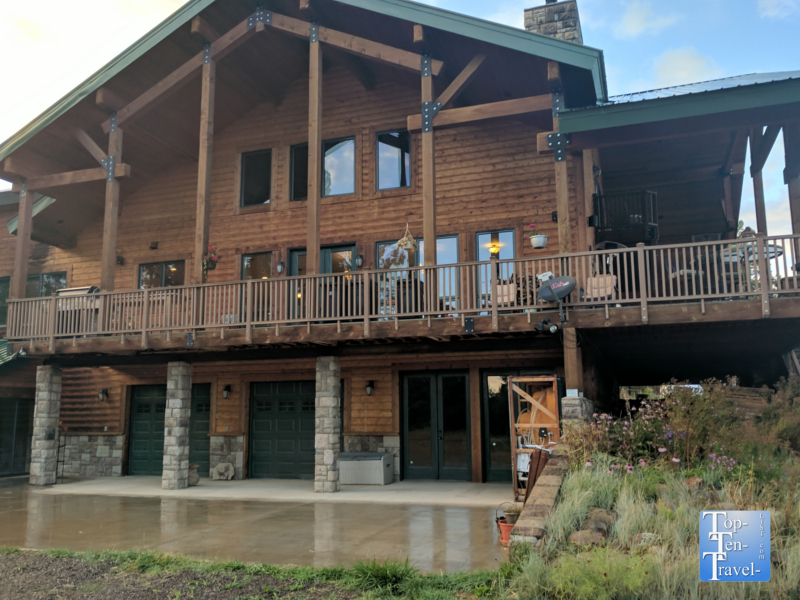 Although the Elk Trace is located a bit away from town, it’s totally worth staying here for the private natural setting. The drive into town is just 20 minutes or so. 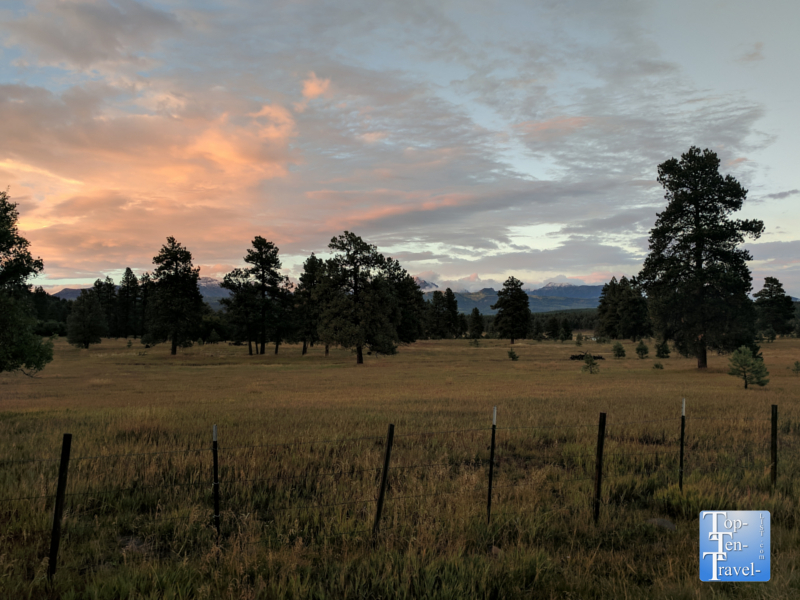 There is so much to see and do in Pagosa particularly if you are a fan of hiking, relaxation, and in general being surrounded by beautiful mountain views in every direction. Here are a few of the top things to do while you are in town. 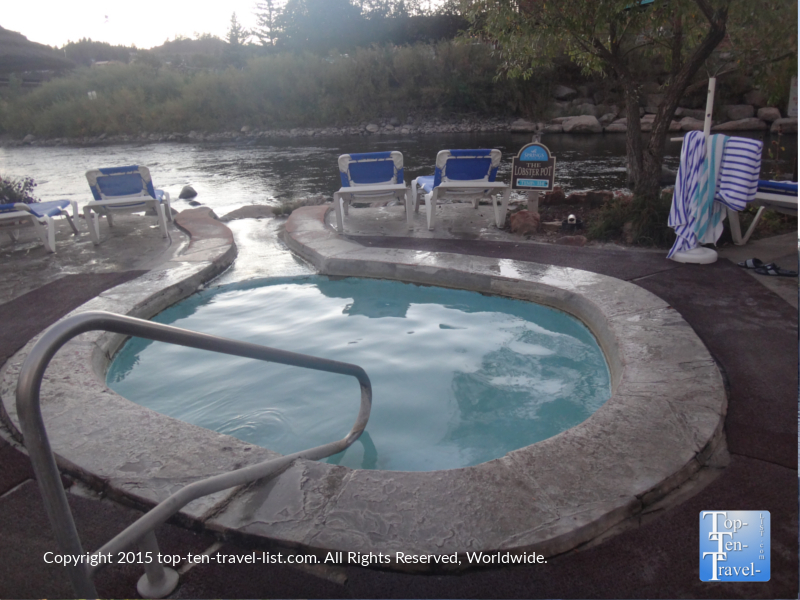 Pagosa Springs is home to the deepest hot springs in the world. The Springs Resort is home to 23 healing hot springs. Not only are the pools super relaxing, but the views of the river and surrounding pines are also spectacular. Soaking in these pools has been treasured since ancient times as the mineral content of the water is said to heal many different diseases, especially those pertaining to the muscles and joints. The high sulfate content is known to be a powerful all over body detoxifier. 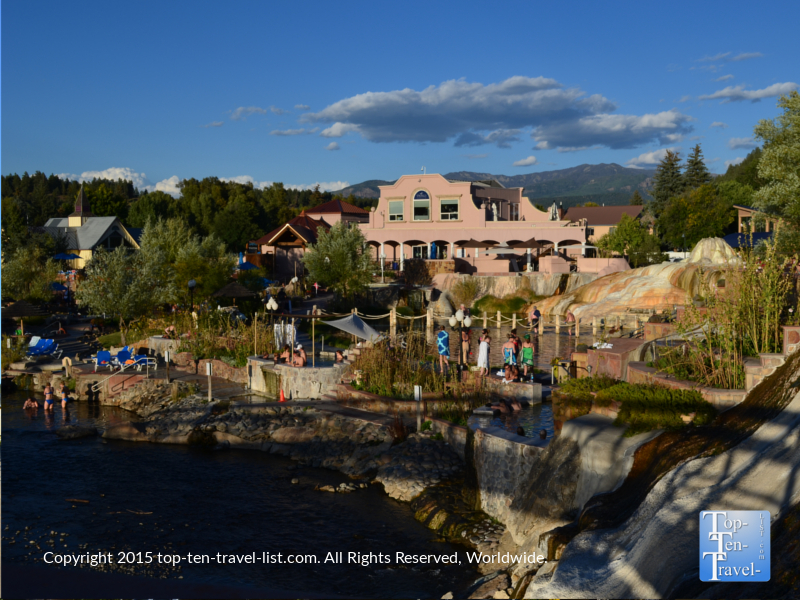 Although there are many different hot springs resorts throughout the US, none combine spectacular views with such a diverse assortment of pools as well as Pagosa’s The Springs resort. A really cool bridge crossings the hot springs to get to the best mineral pool on-site: the perfect 102/103 degree pool. Pool temps range from a cool 83 degrees to over 110 degrees on average in the “Lobster Pot.” All pools are fed from “The Mother Spring” which is 144 degrees. There are a number of pools in the 100-105 degree range, which is the most perfect temperature range for relaxing on a cold night. As you soak you can literally feel all your stress melting away. Really, it’s impossible not to relax here. 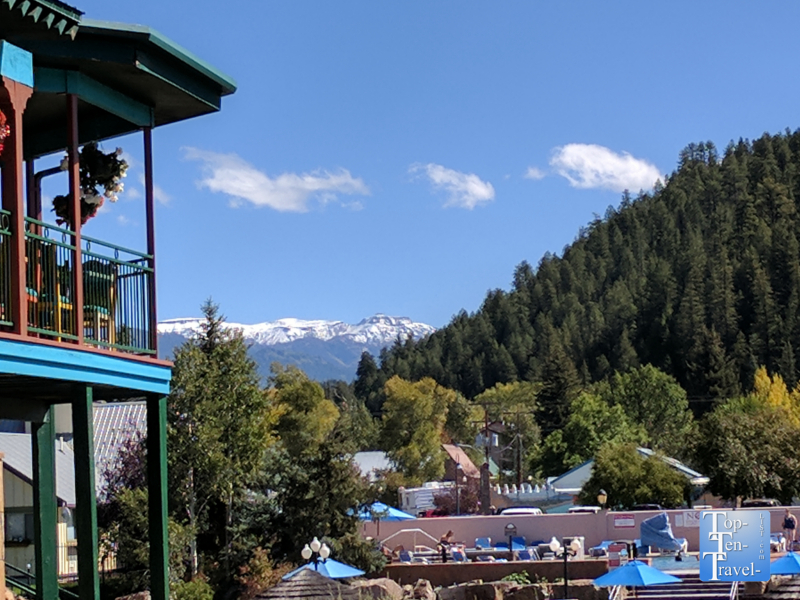 And for some reason (most likely no easy access as the small Durango airport is very pricey and Denver is hours away), this resort and the area in general does not see nearly as much traffic as you would expect. The on-site spa is extraordinary as well. There are so many little extras included in your treatment (like eye pillows and hot towels) which are not typically included in with the base price at most spas. Plus, you get free admission into the springs with any treatment (which is normally 30 bucks), so really it’s a steal. 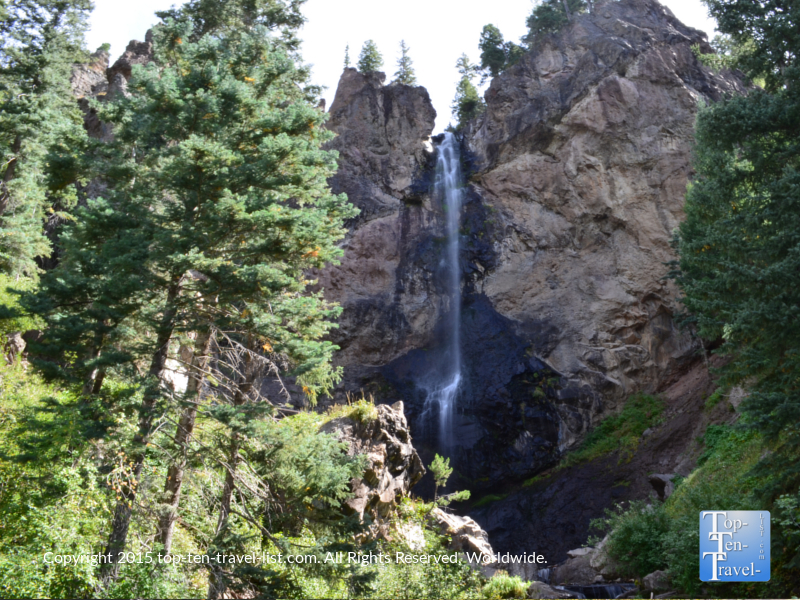 There are many wonderful hiking trails within the massive San Juan National Forest. Treasure Falls is one of the best choices for tourists as the hike to get to the falls is easy, relaxing, and incredibly scenic. 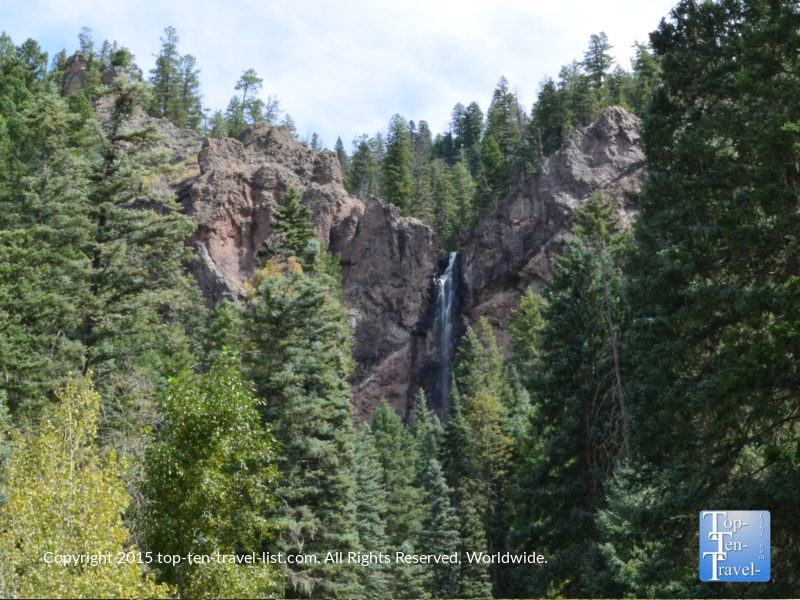 The towering 105 foot tall waterfall is accessed via a short steep stroll of just under a half mile. For anyone on vacation looking to take it easy but still enjoy world class views, this is as good as it gets. The drive to get over here is picturesque as well with relaxing views of the open countryside. If you really prefer to avoid any hiking on your vacation, you can still view most of the waterfall via a scenic overlook near the parking lot. 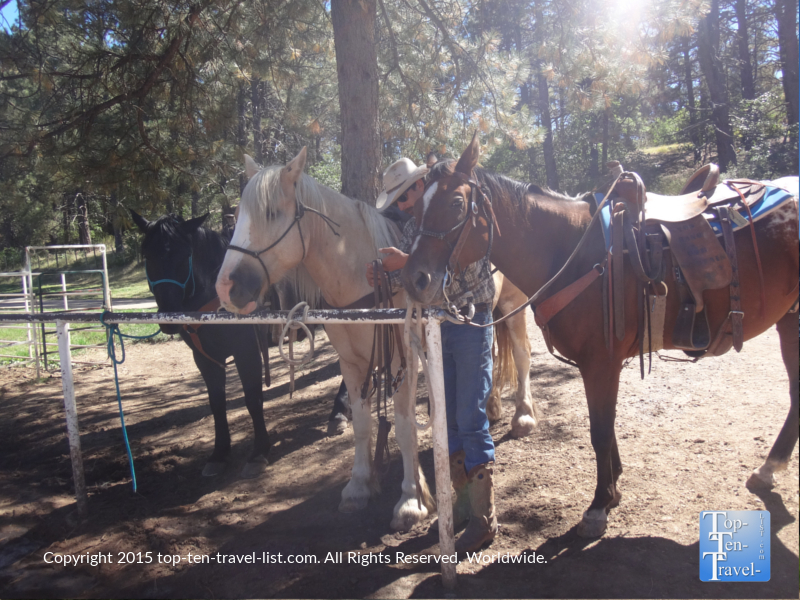 Signing up for a guided horseback tour through the beautiful San Juan Wilderness is a great alternative to hiking. If you are new to horseback riding, I recommend checking out Diamond Hitch Stables. The staff are incredible with newbies and will ensure that you are comfortable with the horses and riding techniques before taking off. They are also really friendly and sociable and quite funny which makes the ride even more enjoyable. The horses are all well-trained, healthy, and well taken care of. Gorgeous views of the wide open countryside. This is one beautiful ride! They offer a number of options, from 30 minute rides to all day tours. The 1.5 hour ride is a nice half day activity which I think is basically the perfect amount of time for any Pagosa vacation. This way you still have time to check out other area activities instead of spending the entire day just doing one thing. The 1.5 hour ride follows a picturesque trail through the woods. It’s very relaxing and very secluded. It’s so quiet that black bears can often be seen in the distance. We did not encounter any wildlife, although the guide carries a gun to scare them off an encounters are pretty common. 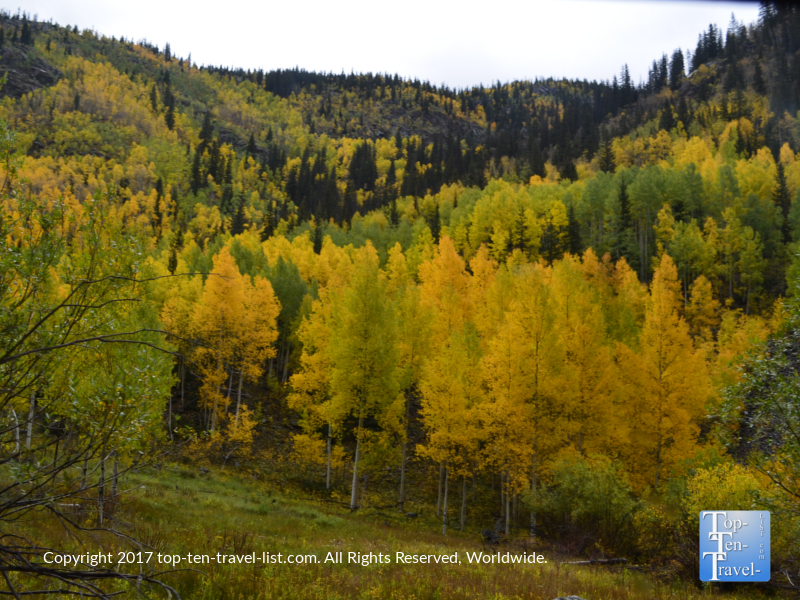 If you can sign up for a fall ride, the colors are really beautiful this time of year with a golden hue cast over the entire area courtesy of the brilliant autumn foliage of the aspens. The people here are all wonderful and will give you lots of tips and tricks if you are new to riding horses so newbies to horseback riding do not be afraid to sign up for a tour! 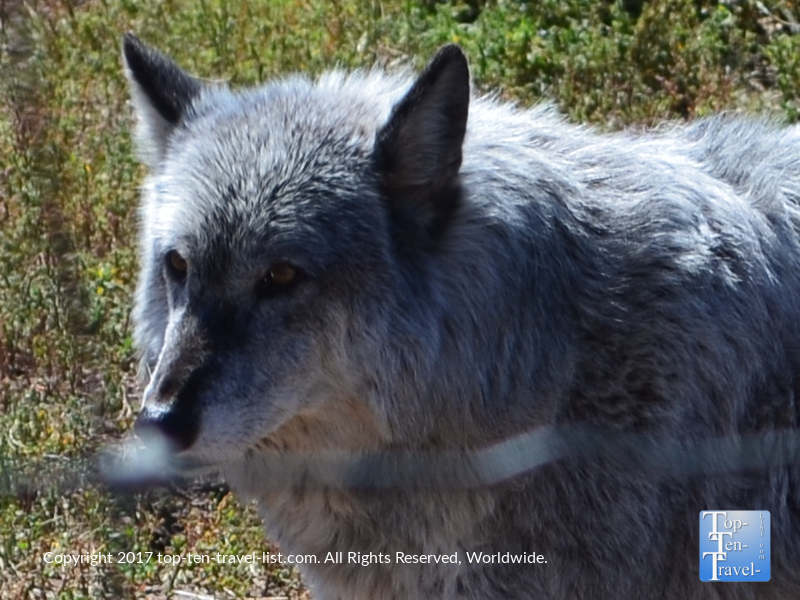 Rocky Mountain Wildlife Park is a privately owned wildlife park where you will find only animals native to the area. Most of the animals are injured wild animals who have been rescued or former pets whose owners realized keeping exotic animals as pets wasn’t the best idea! The park is very small although it’s nice to see animals roaming around in their natural environment and well taken care of. The park is surrounded by gorgeous views of the mountains and it is a relaxing place in general to spend an hour or so out in the beautiful countryside. Beautiful countryside surrounds the park, making it a great place to spend an hour or so out in nature. The drive over to the park is breathtaking, so much so that we got out of our car at several points to take pics of the mountains! If there is any downside to visiting Pagosa it is definitely the lack of dining options. In a way this is a good thing because it keeps the congestion down and the lack of businesses means more beautiful surroundings. 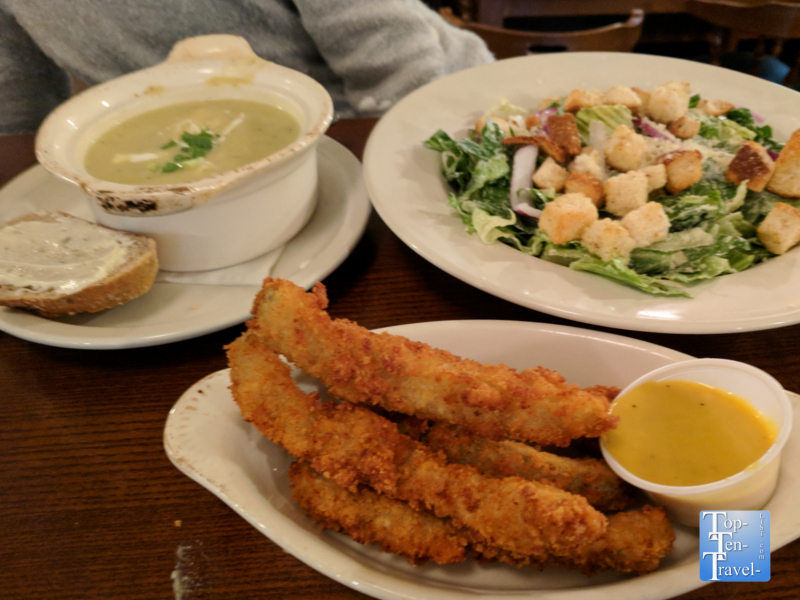 If you are looking for more upscale dining, I recommend taking the drive over to Durango, which is home to a wonderful downtown with lots of great local restaurants. 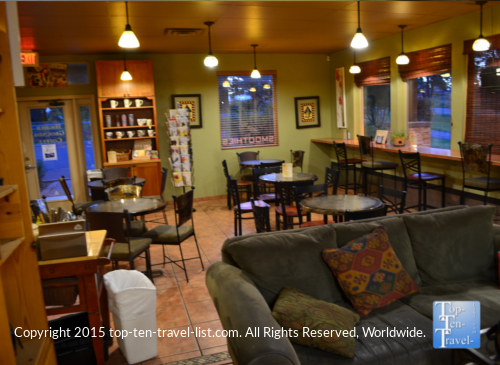 In terms of Pagosa Springs restaurants, here are a few good choices. 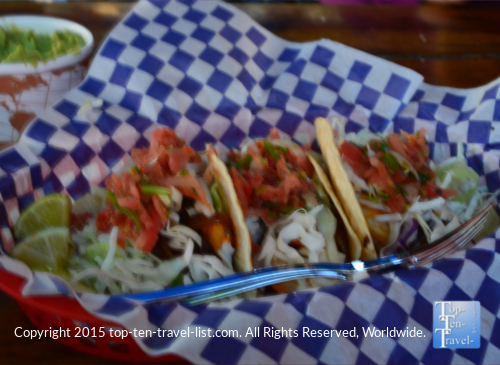 Kip’s Grille – Great casual Mexican restaurant with a lively outdoor patio. Great Grilled Shrimp tacos! 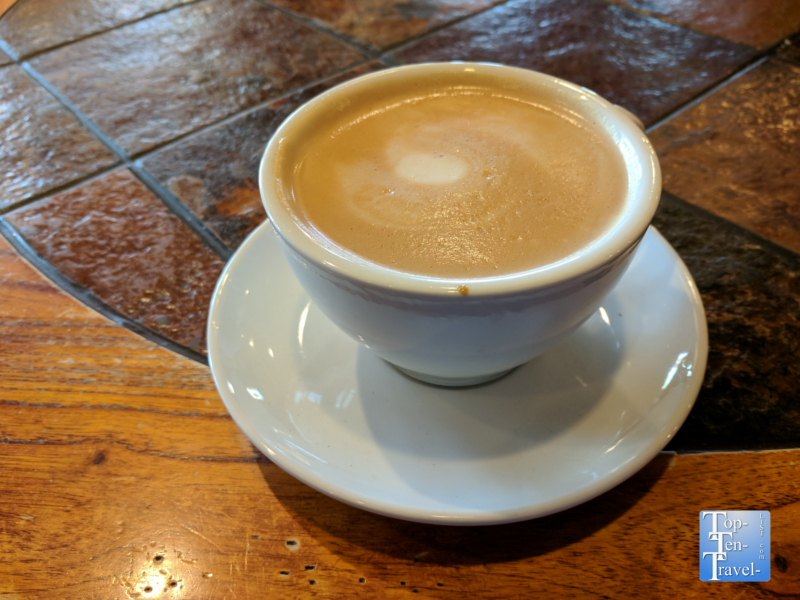 Higher Grounds Coffee House – Great local coffeehouse with a nice rustic ambiance. Delicious espresso drinks and tasty mochas. Fresh baked pastries daily and a small menu of healthy breakfast and lunch options round out the menu. 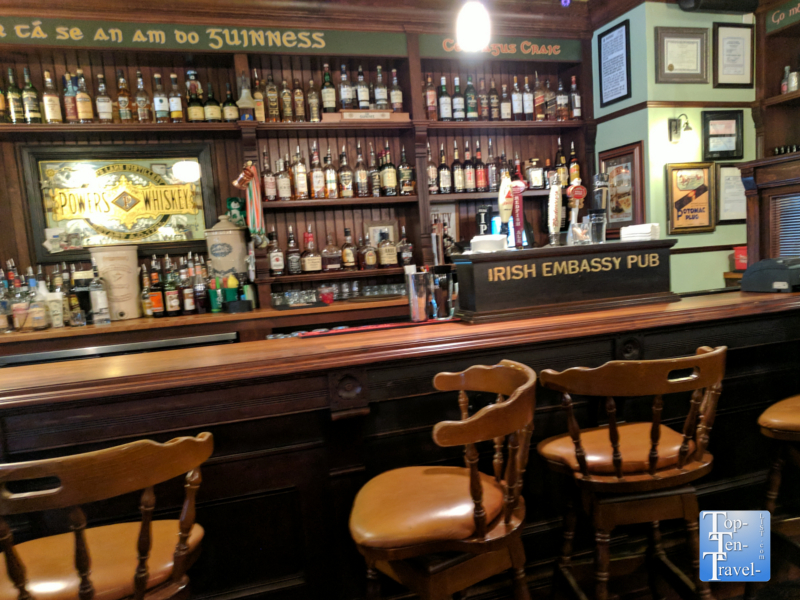 The Fish and Chips and Potato Leek soup at the Irish Embassy Pub are must trys! The food here is all pretty delicious! 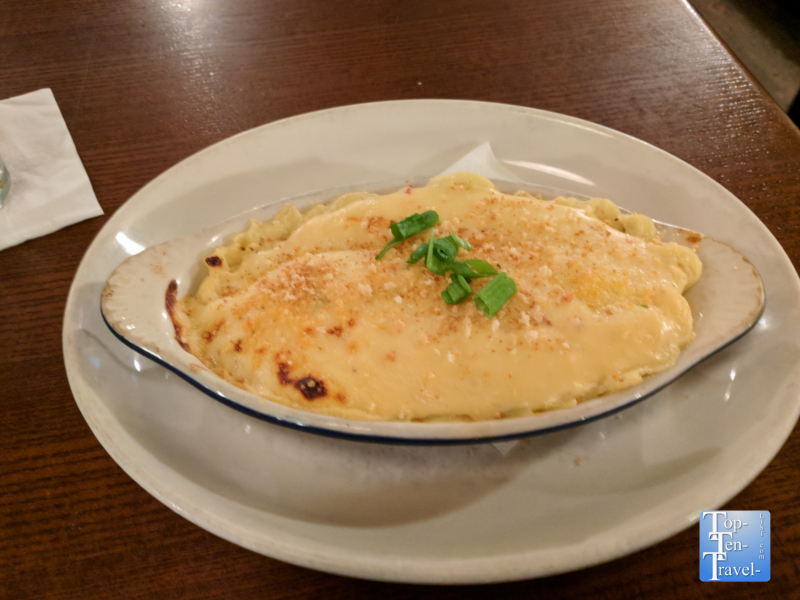 Treat yourself after the long train ride! Jean Pierre offers an amazing selection of homemade desserts. Skip the regular menu (which is severely overpriced) and head straight to dessert! 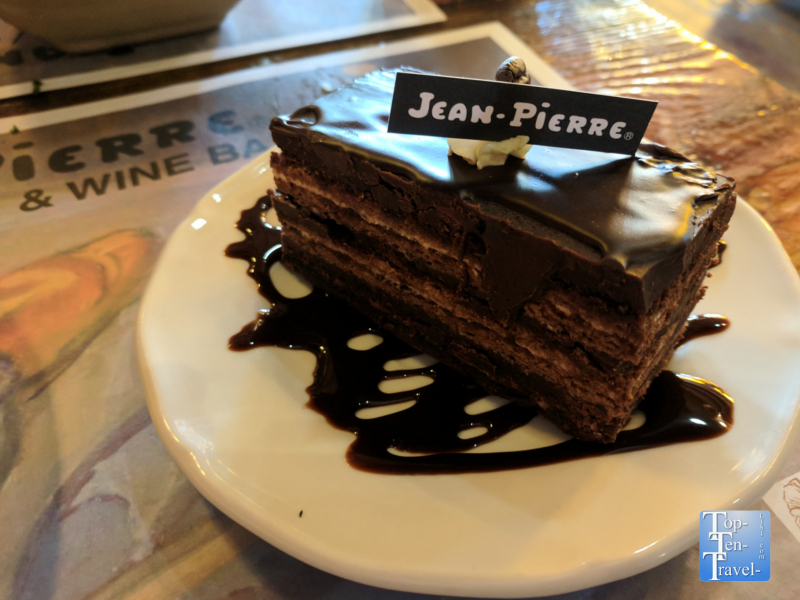 Jean Pierre offers the perfect setting for a dessert date! 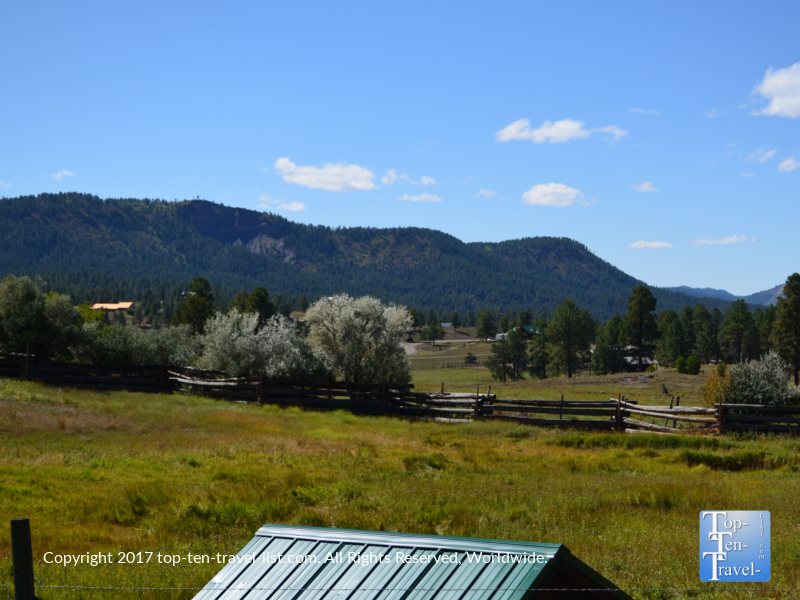 In addition to the many wonderful activities & attractions in the Pagosa Springs area, Durango is just an hour’s drive away. 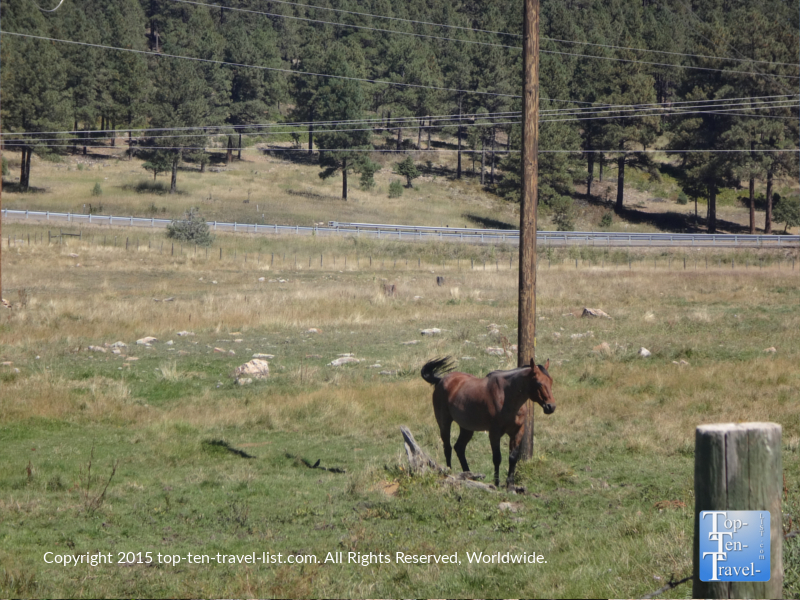 While you are here, you absolutely must plan for a ride on the gorgeous Durango-Silverton Narrow Gauge Railroad. This is without a doubt the most stunningly beautiful train ride you will ever take in your life. Plan your visit in the fall and you will be treated to the same wonderful views plus the most amazing golden foliage. This is a half-full day activity, so be sure to make reservations in advance and block out at least half a day -trust me, it’s well worth it! A few pics from a fall ride – take a look at the post above to see more! If your visit happens to fall during the winter, you still have plenty of opportunity for outdoor fun. Both Pagosa and Durango offer lots of ways to have fun during the cold snowy months. 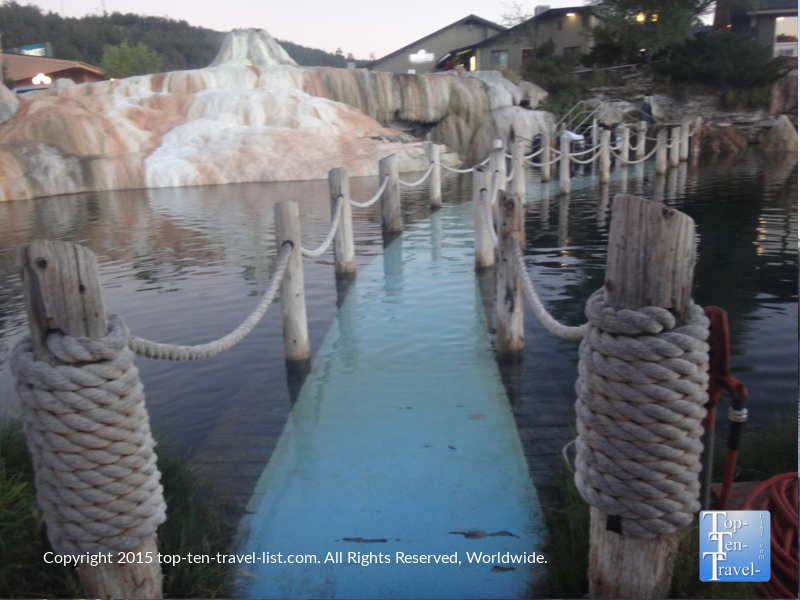 First off, the hot springs are even better during the cold winter season with the spectacular snowy setting. Dog sledding, ice skating, hikes to frozen waterfalls, sleigh rides, cross country skiing & snowshoeing, and ice fishing are some fun ways to past a winter’s day. Wolf Creek Ski Area is just over 20 miles away and known for having “the most snow in Colorado” as the resort sees over 400 inches of non manmade snow per season! Here are 10 more ways to enjoy the winter season in Pagosa. Overall, there’s lot to do in both Pagosa and Durango year-round. 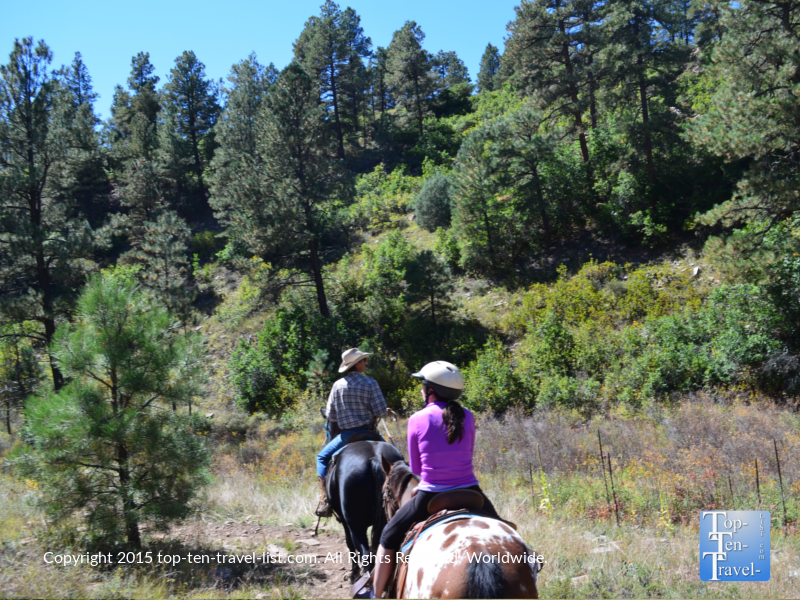 I recommend combining activities in both areas to enjoy the best-of-the-best available in Southern Colorado. 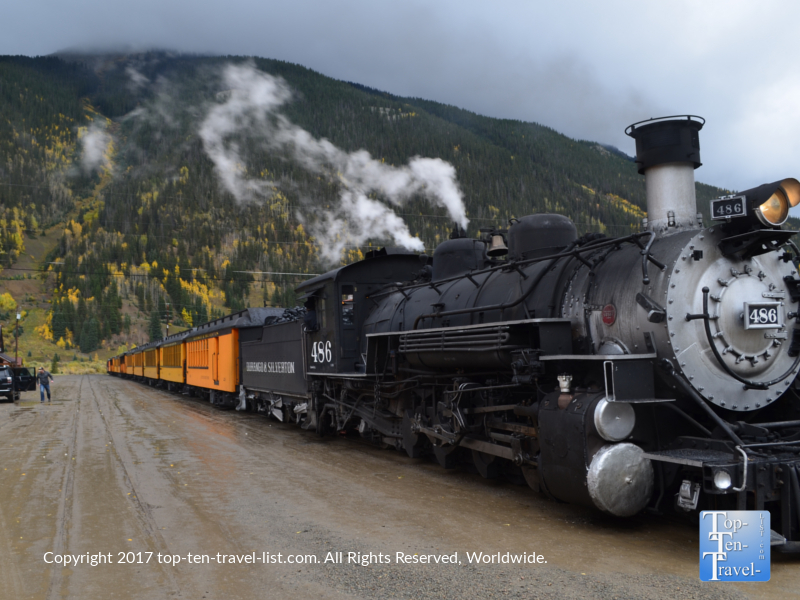 One thing’s for sure -a visit to the hot springs, a hike within the San Juan National Forest, and a ride on the enchanting Durango Silverton railroad should definitely top your must-do list while vacationing in the Four Corners.